Effective and automated competency management creates a real-time and predictive inventory of the capability of any workforce. Skilled talent is at a premium, while retaining top talent continues to be a losing game for most. Organizations are struggling to understand the complexities of five-generation workforces and the nuances of each generation. Predictive HR analytics is beginning to play a much more central role in shaping talent decisions and actions. Efficient and enterprise-wide talent strategies rely on automation, and employee expectations to engage in a holistic work experience require keen insight into existing and requisite employee capability. Be tightly aligned with mission-critical competencies—those that drive achievement of business goals. Employee development often is prioritized only for compliance purposes (particularly in high-consequence industries such as pharmaceuticals or life sciences), yet 72 percent of organizations said the most important factor in an individual’s decision to stay with (or join) an organization is the opportunity for leadership and technical skill building, according to Brandon Hall Group’s Employment Value Proposition Study. Some 31 percent of organizations have yet to define the essential leadership competencies requisite for leaders at all levels to achieve business goals. Of those that have, a mere 8 percent have automated competency management, according to Brandon Hall Group’s 2016 Talent Management Study. Competency management as a business lever for hiring, development, mobility, and promotion started more than 40 years ago. It continues as essential today in the effective management of human capital. To implement competency management to drive employee development and performance excellence, let us align on four key definitions. Competencies are abilities, behaviors, knowledge, and skills that impact the success of employees and organizations. Some common competencies are analytical thinking, communication, flexibility, integrity, and teamwork. A competency proficiency scale is a defined rating or measurement that assigns an expected level of competence on a given competency. Leading practice scales have behavioral indicators as their building blocks with related behaviors organized under each competency. Scale ratings range from three to seven mastery levels, with five levels being the most common. Competency management is the set of management practices that identify and optimize the skills and competencies required to deliver on an organization’s business strategy. Competency management provides the foundation to manage strategic talent management practices such as workforce planning, acquiring top talent, and developing employees to optimize their strengths. Competencies are the foundation and starting point of high-performance talent management. Many of today’s organizations can be characterized as distributed, matrix, and global, with functions that often operate autonomously in the absence of governance. These factors make efficient and effective identification, utilization, and implementation of competencies difficult. In fact, 69 percent of organizations surveyed said their competency management was only somewhat, or not at all, effective. Interviews and focus groups with executives and other business and HR leaders exposed six competency challenges prevalent in many organizations. Competency management is treated as an HR process, rather than a business imperative. On average, 88 percent of organizations identified better leader and employee performance as important or critical to the business. When asked about the single most important call to action to improve performance, interviewees said, “Tell employees what is expected of them to excel.” Performance excellence, then, means clear communication of the competencies for which an employee is accountable. But in our 2015 State of Leadership Development Study, 31 percent of organizations said they had not defined their critical leader competencies, much less any of the others (core, functional, or career). Until competency management is revered as the business imperative it is, performance will continue to languish. Identification of critical competencies is difficult. Without an assessment strategy (15 percent) and the ability to predict the skills needed by the business going forward, organizations are left clueless as to what skills exist and are needed. Some 74 percent of organizations say that definition of essential competencies by talent segment and job role is critical, or important, to the business. Yet, a stark .7 percent of organizations have the means to predict the essential skills required. Alignment of competency development with business goals is weak. Some 61 percent of organizations have only somewhat effectively, or not at all, identified critical talent segments and key job roles. Hence, it goes without saying that most have yet to define critical job responsibilities and success criteria. In the absence of these competency procedures, it is no surprise that 72 percent of organizations indicate that employee and leader skill building is only somewhat, or not at all, focused on developing competencies requisite for achieving business goals. Investment in competency management is deprioritized. For the first time ever, an organization’s people strategy supersedes the organization’s business strategy, in regard to its importance in meeting business goals. It is difficult to find a single people strategy that doesn’t include a competency strategy. Yet when asked about financial investment, competency management has been on the decline and well behind many other talent processes. In 2014, only 9 percent of talent management budgets were allocated to competency management. In 2016, that number dropped another five points, putting competency management in a tie for fourth to last place. Competency models are exclusive of technical competencies. Too often organizations exclude technical skills from the functional portion of their competency model. Technical skills are prevalent among many critical job roles including engineers, IT specialists, medical professionals, and others. However, in many organizations, their competency models are, unfortunately, void of technical competencies. Competencies are too often paper-based. 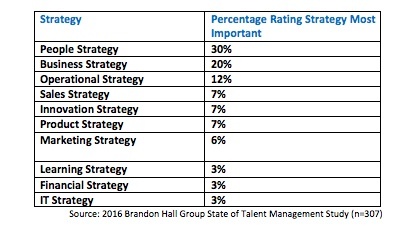 In Brandon Hall Group’s 2015 State of Performance Management Study, 30 percent of organizations said their primary tool for managing performance is paper-based spreadsheets. Without an automated competency model, leadership is challenged to accurately assess employee performance and focus on developing strengths and closing skill gaps. Automating competency management, among other things, provides a means to create a standard approach to competency management across the enterprise and provide for integration of competencies among all talent processes. Effective and automated competency management creates a real-time and predictive inventory of the capability of any workforce. By defining and automating job roles and associated competency proficiency, leadership can readily identify strengths and skill gaps. Competency management then informs targeted skills development learning solutions improving individual and organizational performance, leading to better business results. Enriched understanding of expected behaviors and performance. Of course, the quickest path to improving performance starts by knowing the target performance. Organizations that take the time to define the short list of competencies and expected proficiency level for each competency, by job role, essential for the achievement of business goals, have taken the first step toward giving employees and leaders the best shot at performance excellence. Improved talent planning. Competency assessment results inform leadership about current and future talent capability. To be assessed as competent, the employee must demonstrate the ability and experience to perform a job’s specific tasks. Data and analytics about employees’ skills and knowledge are essential for performance risk mitigation that leadership would otherwise be blind to. Optimized development and mobility strategy. High-performance organizations realize that organizational success depends on how capable their people are. They also recognize that formal training does not necessarily equip employees with the appropriate skills to thrive in the workplace. This is where competency management and competency-based development comes in. Competency-based development is created around the competency standards that have been identified for a specific role in an organization. Enhanced talent pipeline. Automated competency management enables on-demand information about employees’ and leaders’ competency mastery and readiness to move into next-level or other critical roles. In this fashion, organizations are better prepared with development planning and, as a result, yield healthier talent pipelines regardless of business cycle or economic conditions. Improved operational efficiencies. Competency management automation facilitates business-driven learning and development, eliminates non-value-add training, highlights strengths to be further developed, flags critical skill gaps for mitigation, and generates higher levels of employee and leader satisfaction with their overall experience with the organization. Integrated talent processes. Serving as the standard for expected performance by job role, competency management becomes the standard by which the highest-performing organizations talk about and manage all phases of the employee lifecycle: from talent acquisition to development, to retention and reward. Laci Loew is vice president and principal analyst for Talent Management Research for Brandon Hall Group, a human capital management (HCM) research and advisory services firm with more than 10,000 clients globally and more than 20 years of experience in providing insights around Learning and Development, Talent Management, Leadership Development, Talent Acquisition and HR/Workforce Management.